Drs. Jack Warner, Breigh Burns, Susan Willis, and their team are committed to bringing you and your pets better health by practicing the science of Veterinary Medicine. 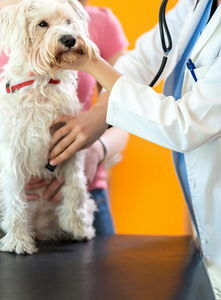 Exceptional Care for your Exceptional Pet! In June 2003, a new branch office was opened in Kingston for outpatient services. Animal Medical Center of Kingston is located in Ladd Landing beside Food City and offers the same high standards of quality and compassion for all your outpatient needs. Graduating from Auburn University with a doctorate of veterinary medicine in 1976, Dr. Warner is still an AVID University of Tennessee fan(where he received his undergraduate degree). He opened his first practice, 'Warner Veterinary Clinic' in the summer of 1976 on Hwy 27 with one employee. Animal Medical Center (name changed in 1997) is now a two story Full service hospital with 15+ employees and state of the art equipment and services. Dr. Warner specializes in Orthopedic and Soft Tissue Surgery and outside of work loves to play golf, go to UT football games and travel. He is married to Dee and has a daughter (Dr. Breigh Burns) who joined his practice as a doctor in 2002. He has five dogs, two outside labs and three inside small house dogs. Dr. Susan Willis graduated form Rockwood High School in 1984. She then went on to University of Tennessee for undergraduate work and vet school. She graduated from the University of Tennessee College of Veterinary Medicine in 1990 and start working at Village Veterinary clinic in Farragut. After a year there, she came back to Animal Medical Center, where she had worked during her college years, as a veterinarian. Twenty-something years later she is still happily taking care of her beloved patients in the Roane County area. Dr. Susan lives on a farm with her husband Jay and daughter Melissa. Along with dogs Gnat and Annamarie, a hedgehog Spike, and a horse Sugar. Dr. Breigh Warner Burns (daughter of Dr. Jack Warner) grew up 'literally' here in Animal Medical Center. After years of working as an assistant/receptionist/whatever, she graduated from the University of Tennessee College of Veterinary Medicine and came back as a Veterinarian in 2002. Her special interests include: general surgery, radiology and internal medicine. A Roane County native and RCHS 95 graduate, Dr. Breigh lives in Kingston with her husband, Darren and their two daughters Aubree and Cailyn. She enjoys dancing, Zumba, being out on the lake and playing with her kids. They have three four legged children, a scottie named Bolden, a french bulldog named Eddie, and a cat Meowchee.